We take great pride in forming a bond with each and every one of our patients, by working together to achieve a healthy and beautiful smile. You will never simply be a “chart,” or a “number,” or “the next patient up” in our office. We strive to genuinely listen to your questions and concerns, and address them appropriately and effectively. We understand some patients may be apprehensive about dental visits. Rest assured we will take every step possible to create a comfortable and relaxing environment during your appointments. We have assembled a team that is very compassionate about your feelings towards your dental needs, and you should NEVER feel embarrassed about any problems you may have. We understand just dialing our number to schedule that first appointment might be stressful…but we also understand it’s the very first step to achieving your goals. No matter what the issue, no matter how long it’s been....we are here to help you, not discourage you. We can’t wait to meet you! 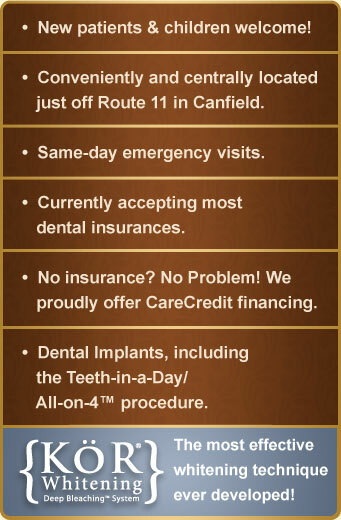 Give us a call today at (330) 533-1961 to schedule a visit for you or your family!